The 2017 IBC Show is winding down, but the SVG Europe and SVG Americas editorial teams are still out in full force, covering all the latest news from the show floor. In an effort to make the tidal wave of news and announcements more digestible to readers, SVG is providing a daily “SportTechBuzz at IBC 2017” roundup. This daily rundown provides snippets of big announcements and what is on display at hundreds of stands at the RAI this year. 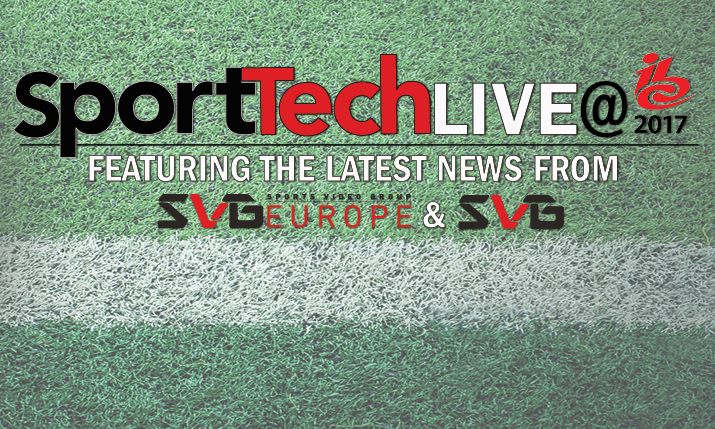 Here is the Day 4 (18 September) SportTechBuzz roundup, featuring news from Irdeto, Harmonic, Evertz, Brainstorm, Imagine Communications, Vitec, Net Insight, Vizrt, Adobe, EVS, Canon, Vislink, Grass Valley, Intelsat, Grabyo, Nevion, SES, Prime Focus, wTVision, Ross Video, Solid State Logic, Zixi, Sennheiser, Snell Advanced Media (SAM), Calrec, Square Box Systems, MX1, VIDELIO, Dalet, Yamaha, Ericsson, AJA, Telos Alliance, Riedel, Panasonic, Media Links, and NEP. Evertz rolled out DreamCatcher 1 this week, a system that Marketing Manager Bob Fung describes as another point of entry for users. “It has all of the core features and is targeted towards smaller productions that need two or three systems,” he explains. “It’s a live-production solution that uses the same hardware as the 400 series, so it is also fully upgradeable.” And Evertz also continues to put IP-based systems front and centre, including the Vue context-oriented user interface. Imagine Communications (Stand 4.A01) has introduced Versio Platform, a workflow platform designed to enable media companies to optimise their playout and related operations to meet finely tuned operational and business objectives. Versio Platform provides content producers and distributors with a menu of tightly integrated functional building blocks for constructing a fully modernised playout facility that can be customised to precise operational requirements. Versio Platform marks a major milestone in Imagine Communications’ ongoing modernisation of playout operations and represents the industry’s first cloud-native, microservices-based, and modular playout solution. The latest version of Net Insight’s (Stand 1.B40) Sye OTT solution live-streams with latency in sync across all devices and now has a new network-timeshift capability. Net Insight has also integrated its Nimbra platform with Calrec’s RP1 remote-production unit to create a complete audio–remote-production solution. Adobe (7.G27) is previewing several new features and upgrades to its Premier Pro NLE platform, including new virtual-reality video-creation tools. Creative Cloud for video, Premier Pro will soon feature an immersive VR viewing environment that allows editors to review their timeline and use keyboard-driven editing for trimming and markers while wearing the same VR head-mounts as their audience. In addition, audio will be determined by orientation or position and exported as ambisonics audio for VR-enabled platforms, such as YouTube and Facebook. VR effects and transitions are now native and accelerated via the Mercury playback engine. xG Technology is at IBC for the first time since acquiring Vislink (Stand 1.A69) this year and merging its operations with xG Technology’s Integrated Microwave Technologies (IMT) division. Vislink introduced its HCAM HEVC 4K UHD wireless camera transmitter to the European market. Although no release date has been announced for HCAM, Vislink Global Sales Director David Robins says the launch is planned before the end of 2017. He adds that he sees HCAM technology being used not only for RF wireless handheld cameras but also for onboard cameras in motorsports coverage. IBC 2017 marks the debut of Intelsat (Stand 1.C71) and Dejero’s new CellSat hybrid cellular/satellite transmission system. The joint venture, which was introduced last month, provides a new transmission option for live remote productions by leveraging Dejero’s multi-carrier cellular solution and Intelsat’s Ku-band IP connectivity. According to Intelsat VP/GM of Media Services Rob Cerbone, CellSat is ideal for sports venues with low connectivity, such as public golf courses, race tracks, smaller college venues, and even high schools.